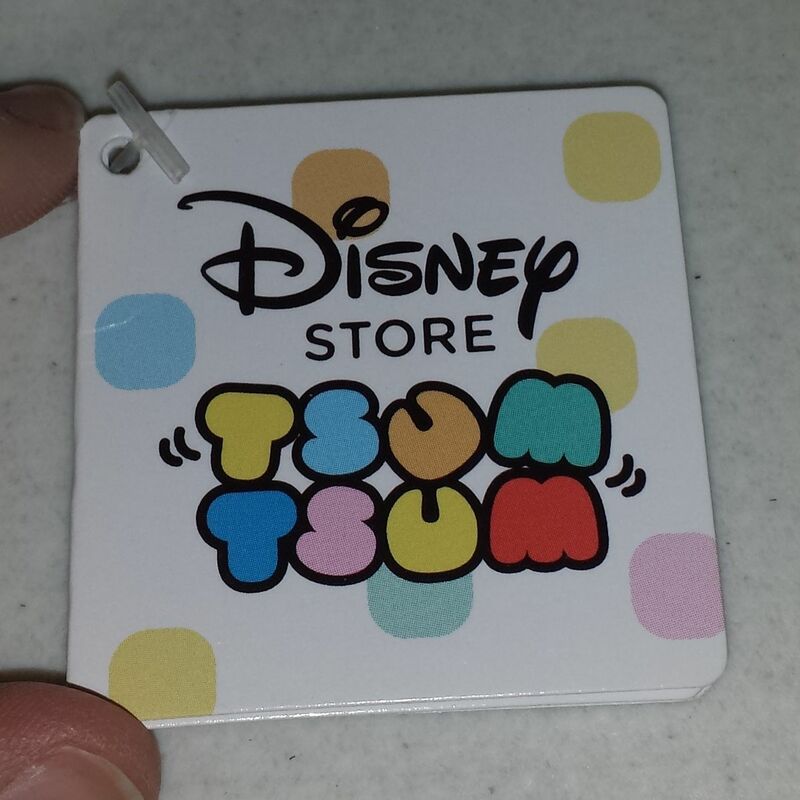 Even the Tsum Tsums tags are adorable! Have you heard about the newest Disney collecting craze? No? Let me tell you what they are: A series of collectible plushies (stuffed animals), drawn from a wildly popular mobile game in Japan, featuring Disney characters. These plush toys are called Tsum Tsums, which means “stack, stack” in Japanese, from the game’s objectives, and is pronounced “tsoom tsoom” (which basically sounds like zoom zoom). The toys are designed to be stacked up in a pyramid shape, much like the objective of the game. 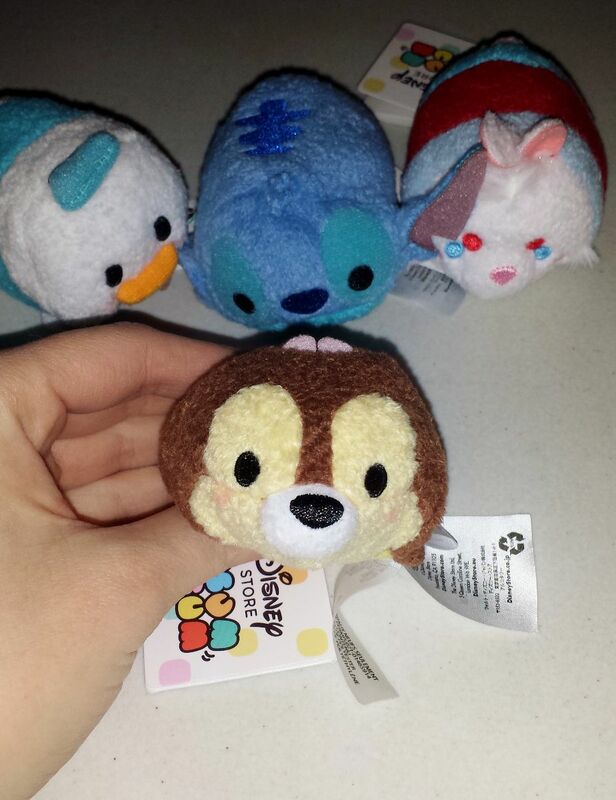 Donald Duck, Stitch, The White Rabbit, and Chip mini Tsum Tsums! Did I mention that they are adorable?? They come in three sizes, mini, medium, and large, and Disney is struggling with the difficulty of keeping them on the shelves, as they are becoming just as popular here as in Japan. The prices are $4.95 for mini, $12.95 for medium, and $24.95 for large. 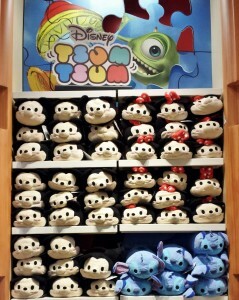 Here’s the Tsum Tsums stacked! They are 3.5″ long, and cost $4.95. However, due to their popularity, the Downtown Disney store only has them in medium and large, and even then, with limited characters available. When asked about when they would be receiving more, the staff didn’t have a firm answer, but simply that it would be awhile. The (very limited) wall of Tsum Tsums at Once Upon a Toy. The Tsum Tsums came out in Japan in 2013 and have so many more options that hopefully will come to our stores soon. 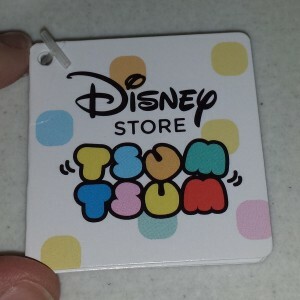 If you are interested in seeing what we may eventually get here (and want to feel jealous), check out the Japanese Disney store’s Tsum Tsum page. This medium Minnie Mouse Tsum Tsum is $12.95 and is 11 inches long. The game that made the Tsum Tsums popular is available now in the United States on both the App store for Apple products and the Google Play store for Android devices, though you will need an account from Line (another app) to save your game information. The LINE app basically gives you free calls and messages, though I didn’t actually try to use them app. I downloaded the app, created an account, and then deleted the app once I was started in the game. 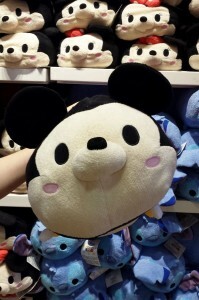 The large Mickey Tsum Tsum is $24.95 and is 17″ long. Disney also has given us a video to introduce us to the new adorable critters, and while it doesn’t really explain anything, it’s cute enough to watch just to see what characters we may eventually be able to collect. Disney is advertising the game everywhere, and you might spot a banner for it anywhere you go on the web or as an ad in mobile applications. 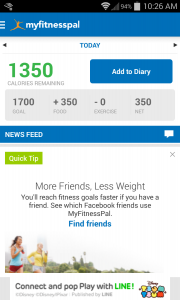 I even spotted an ad for Disney’s Tsum Tsums in my calorie tracker! 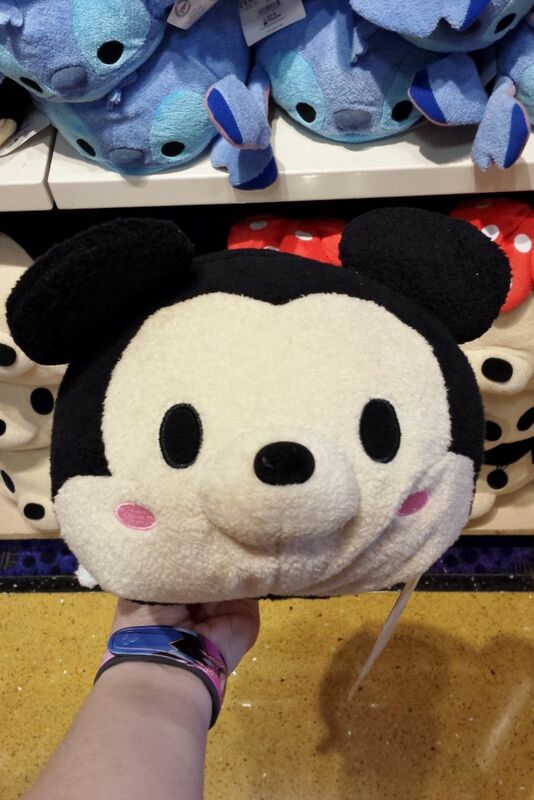 Keep your eyes peeled for where you can spot Tsum Tsums next! What do you think? Do you want to start a Tsum Tsums collection? Katie McNair was born and raised in Central Florida. She grew up visiting Disney World as often as she could manage. Her favorite park is Epcot, and her favorite attraction is Living with the Land. Katie currently teaches 7th grade language arts. Another Disney “collectible” destined to only increase in value. I would stock up if they did! They make cute little presents, and my students love mine I have at school. They would be the best prizes ever! They won’t be on any outlet stores any time soon. They sell out as soon as they are in the stores around here. I’m still disappointed I didn’t get to add another one (or two!) to my collection! Maybe soon Disney can catch up. My toddler is going to go nuts over these, that I can tell you for sure. My husband and I just found this game last week and are completely addicted. We signed up for line so we could gift lives to eah other! 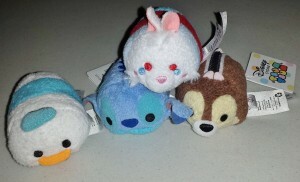 We are headed to Disneyland in 3 weeks, and I’m hoping to buy a small tsum tsum while were there. 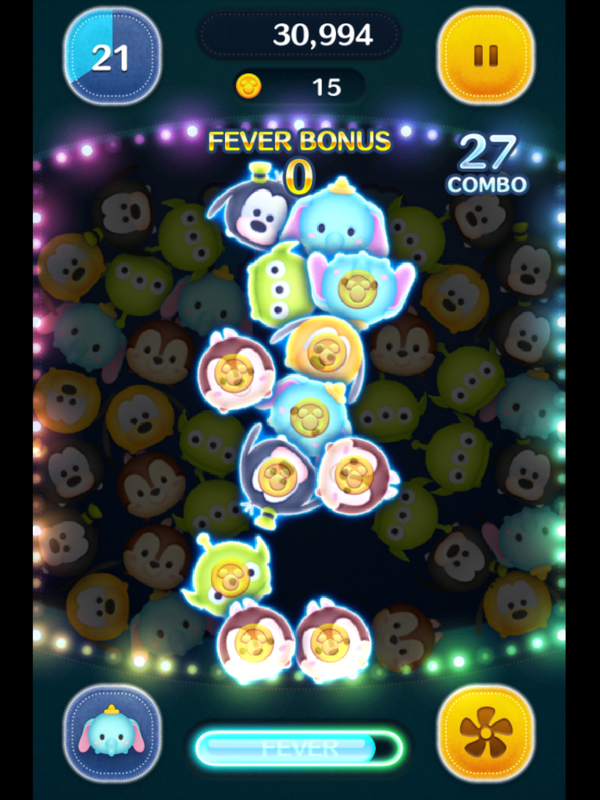 I thought the Tsum Tsums were adorable, but it was awhile after I had my first one that I downloaded the game to try… and now I’m completely addicted. I just got the new yellow bunny Tsum Tsum from the premium box… it’s a fun one! 🙂 Thanks for reading, and have fun in Disneyland! This is such a fun little game to play! I’ve been hooked for about a month now and can’t wait to get some of the stuffed little guys.